House shifting is a Hercules task, people spend most of their time (these days most is just not more than hours) to find Cheap Packers and Movers instead of Reliable Packers and Movers. 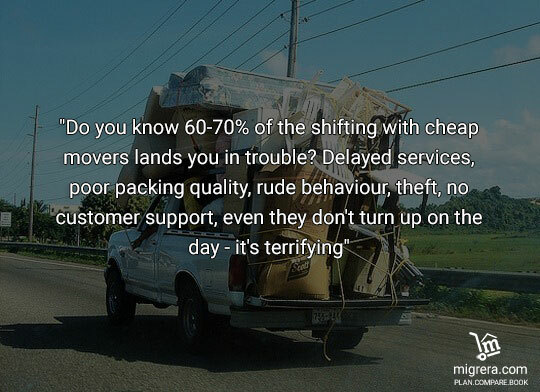 "Do you know 60-70% of the shifting with cheap movers lands you in trouble? Delayed services, poor packing quality, rude behaviour, theft, no customer support, even they don't turn up on the day - it's terrifying"
Household goods are very close to our hearts, hard to earn So we advise not to keep them in risk at the cost of few bucks. We understand people don't have time in their busy life, so they choose what they get in their way and within their budget. The majority of the people are afraid of high-end movers. Definitely, there service standards are far better than the cheaper once and theirs price are rocket high. Only the high-income group can afford them. These days everything starts with a simple google search "packers and movers Hyderabad". If you do this, you will find most of the websites saying "free quotes, cheap packers and movers, quotes in 5 min". For a moment, even if we believe them, Is house shifting all about quotes? Don't you care about the packing quality, customer support, on-time shifting, payment security, move day co-ordination? "Getting quotes is just 30% of the house shifting, Think about the rest 70%". 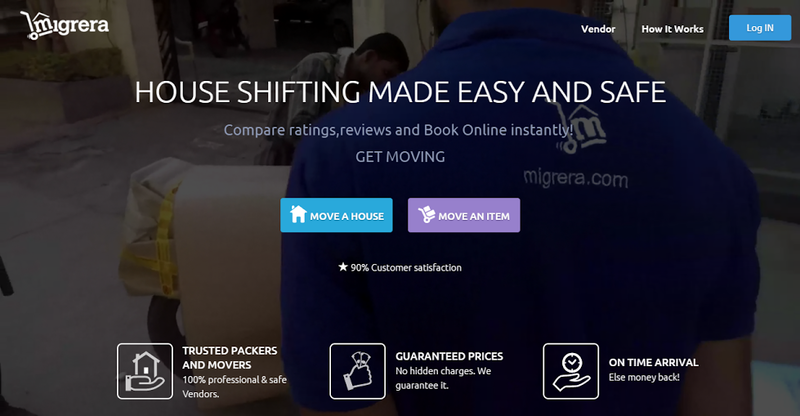 After scouting the market for more than 6 months, understanding both sides of the market - moving industry and customers, we have built a platform Migrera. Migrera - is not just a booking platform, it is a complete moving solution. Customers can PLAN, COMPARE and BOOK a move. Once booking is done, we take care of all the move day co-ordination required to get you settled at your new house. We even go a step beyond and help you with any post-settlement process needed. Our technology with a human touch, makes your house shifting easy, secure and affordable at a push of a button like never before. Migrera removes all the hassle between you and your move. Great UI/UX to pick inventory and get precise quotes from multiple Packers and Movers in Hyderabad. Best Quotes from our Trusted and Reliable Packers and Movers within 24 hours. Guaranteed Prices - What you see is what you Pay. No hidden Charges. On Time Arrival - We are the first and only platform to provide On Time Arrival on the move day. Superior Customer Experience through our Move Marshals - who understands the needs of each individual customer, live co-ordinates with the vendors and customers on move day to make sure of no last minute surprises. Smart Alerts - Our intelligent system to track and keep you updated on the status of your move right from booking until you get settled at your new place. 24x7 Customer Support - No bots! Real humans 24x7 at your service. If your are shifting in Hyderabad or wanted to know more visit Packers and Movers in Hyderabad to have a smooth and a hassle free move.